Just weeks after John Bolton’s hardline rhetoric infuriated North Korea and nearly derailed a planned summit between Kim Jong Un and President Donald Trump, the U.S. national security adviser appears to have taken a back seat to Secretary of State Mike Pompeo for the historic meeting. While the hawkish Bolton – who has adopted a lower-key approach in recent days - is expected to be in Singapore for the talks on Tuesday, Pompeo has taken the lead as the administration assumes a softer tone toward Pyongyang ahead of the summit, several U.S. officials said. Pompeo’s ascendance combined with Bolton’s more muted public role illustrates how the sometimes messy power dynamic in Trump’s inner circle has played out going into the first-ever meeting between U.S. and North Korean leaders. But Trump’s ability to deliver the biggest foreign policy success of his presidency could rest heavily on the team he has hastily cobbled together to advise him after announcing in March he was prepared to meet Kim in an effort to persuade the North Korean leader to give up a nuclear arsenal that now threatens the United States. “This summit is being thrown together faster than any we’ve ever seen for something this important," said one U.S. official, speaking on condition of anonymity. “So unless we want the president to get played by Kim, a lot rests with the team that's putting this all together." Pompeo, first as Trump’s CIA director and now as his chief diplomat, quickly made North Korea his main focus. But even as Pompeo was launching delicate diplomacy, Bolton – an outspoken former U.N. ambassador with a history of fraught dealings with Pyongyang - took up his post and began pushing a tougher approach to North Korea that he has long advocated. Never was that clearer than when Bolton went on television on May 13, just days after Pompeo returned from a second visit to Pyongyang, and pressed North Korea to follow the “Libya model” in nuclear negotiations. Libya unilaterally surrendered its nuclear weapons program in 2003, but its leader, Muammar Gaddafi, was killed in 2011 by NATO-backed rebels. sought to salvage the meeting by disavowing his remarks. But North Korea responded harshly. Trump on May 24 then canceled the summit, only to reinstate it a week later after meeting a North Korean envoy at the White House, where the president appeared to back away from his demand for Pyongyang’s swift, complete denuclearization. Bolton – once denounced by North Korea as “human scum” during his days at the State Department under former President George W. Bush - was conspicuously absent from the Oval Office encounter, raising speculation he was sidelined. 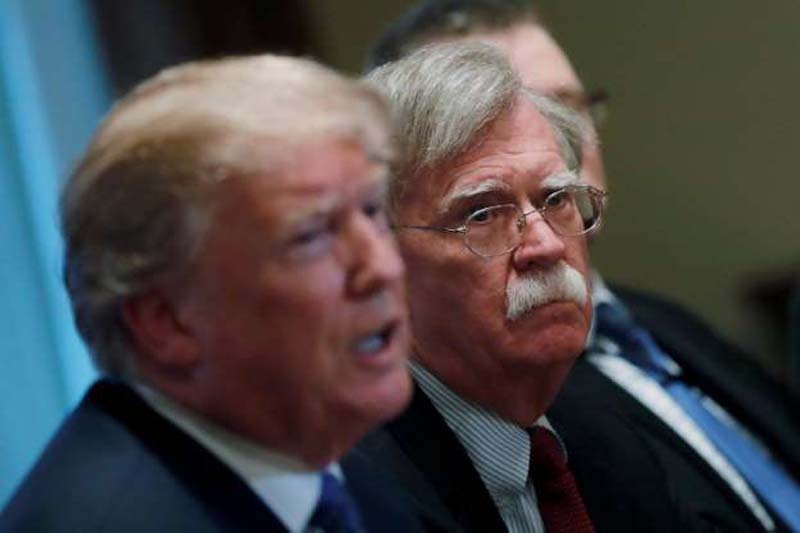 Trump, however, has not frozen Bolton out on North Korea and he remains a key player, according to multiple U.S. officials. Pompeo initially developed a rapport with Trump by delivering his morning intelligence briefings. Trump’s faith in Pompeo is seen as a key factor for entrusting him with the North Korea portfolio. But some U.S. officials and analysts have expressed concern about what they see as the former Republican congressman’s habit of telling Trump what he wants to hear. Also expected to play an important role on Trump’s summit team is Matt Pottinger, Trump’s Asia adviser who reports to Bolton at the National Security Council. The former journalist and ex-U.S. Marine has helped coordinate North Korea policy and is seen by Korea watchers as a pragmatic voice. Sung Kim, a veteran diplomat serving as ambassador to the Philippines, was called in to lead a small delegation that met in recent days with North Korean officials in the demilitarized zone between the Koreas to discuss the summit agenda. He is an ex-ambassador to Seoul and a former nuclear negotiator with Pyongyang. It was a reminder the administration remains short on Asia expertise, especially after the departure of North Korea negotiator Joseph Yun, delays in getting in place a new ambassador to South Korea and the lack of a Senate-confirmed top diplomat for East Asia.